Good grief! 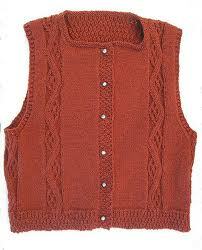 It is now nearly the end of April and I still have not finished the sweater vest I began January 3rd! 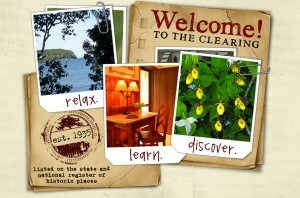 I wrote before about the knitting class I joined in January at Herrschners in Stevens Point, WI. I took the class because I had requested a class that would teach me how to read a knitting chart. 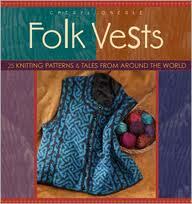 The pattern is the German clock vest from Cheryl Oberle’s book, Folk Vests. I absolutely love this vest! But it has been a nightmare for me. I suppose I should have realized this pattern was way over my head and quit a long time ago, but… I just couldn’t bring myself to give up. I had to have 2 extra help sessions beyond class time. I have to tell you that Peggy, who teaches at Herrscners is the world’s most encouraging, gracious, and PATIENT teacher. What it amounts to is that twisting cables are my downfall - and now my enemy! I’ve not only torn out and re-knitted them all, but Peggy re-designed the back of the sweater to eliminate the cables there. All I had to do was complete the cables under the arms and down the front - and still I’ve had trouble! Well, now it is Easter and I only have to knit the bands around the armholes and neck and the buttonhole and button band down the front. With the end in sight, I have decided that I have indeed learned to read a chart, so in one respect, I have been successful! Concerning twisting cables, I have decided that in the future I am going to leave patterns that require an above average short-term memory to anyone else but me! 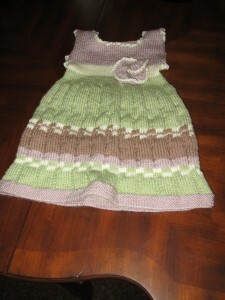 When I finish this vest, I will put it on, take a picture, and post it for you to see. In the meantime, it’s off to the knitters’ salt mine so I can knit something easy and springy. During a recent visit to see my grandchildren, I noticed that the polar fleece slippers I had sewed my daughter-in-law several years ago for Christmas were falling apart. She “loved them hard.” So I promised to sew her a new pair. Using her old pair as a pattern, I bought fleece and sewed her a pair on her old machine. They were too small! Back to the fabric store for fleece I went and sewed her a bigger pair. I tossed the pair that were too small, but my granddaughter, Katie, fished them out of the trash. “Look, Grandma. It’s a puppet!” She even gave him a name - Scruffie! I took Snuffie to the button box and sewed him a face. With scrap yarn, I made Scruffie an attractive hair-do. Katie was thrilled. See the photo! 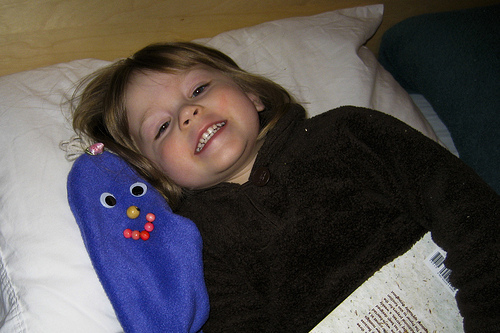 I took the other slipper home with me and made a girl puppet and mailed her off to rendevoux with Scruffie. 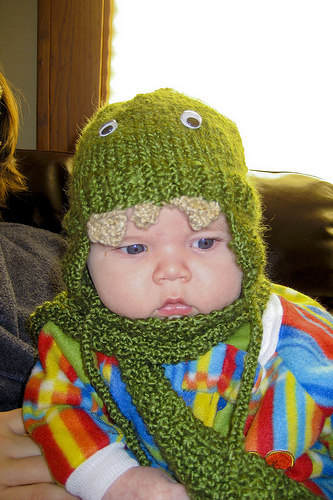 The other photo is of my grandson, Andy, in his hand-knit froggie hat and scarf, which his Aunt Laura made him this winter. So cute!! If anyone would like to knit the frog hat, I can get the pattern to you. I have been sewing since I was 10 years old. My Grandma Elsie was a professional seamstress and dressmaker her whole life. When she was 12, she began to sew for other families. She would go to a client’s home and live there while sewing the season’s wardrobe and do the mending for members of the household. The she would move on to the next household. We lived in Pennsylvania and she lived in Iowa. She was amazing! She could take our measurements (that my mother would send her by mail) and a few weeks later, mail back dresses or whatever for my sister and me. They would fit perfectly! She used the familiar old, little black Singer. For years she also worked in the notions department at department stores. When I was about 8 or 9, I wanted to learn to sew. Grandma visited us once a year and we went to Iowa every other summer for visits. Whenever I was with her, she would teach me to sew. Regularly, she would mail me packages containing her fabric scraps and I would turn them into doll clothes. When I was 13, I got to go spend several weeks with Grandma and Grandpa in Cedar Rapids, Iowa. Grandma said it was time to teach me to sew garments for myself to wear! She worked at Cramers Department Store during the day and my Grandpa worked nights. The first day of my visit, she took me to Cramers to choose my patterns, fabric and notions. Every evening, she would help me get measured, read and cut out a pattern. Then, while she was at work and Grandpa was sleeping, I would sew. When she came home from work, there would be show and tell (and often, rip and re-do). By the end of my visit, I knew how to manage a pattern and cutting. I could sew a French seam, put in a zipper, make buttonholes, set in sleeves, and all the other basic things to garment sewing. Proudly I took many garments that I had made myself! But back at home, I ran into a problem. There was no sewing machine at home! Realizing how excited I was about sewing, my mother managed to borrow an old treadle sewing machine from the mother of our next door neighbor. I learned to sew on a treadle machine, my feet pushing the treadle back and forth with a steady rhythm. My father often would say no to a new dress from the store, but he always gave me money for fabric and pattern. Looking back, I see that he was encouraging me to practice and hone my new and useful skill. However, by the time I was 16, I had run out of patience with the treadle machine. After all, even Grandma Elsie had an elecric machine to sew with! For my 16th birthday, I received a brand new Kenmore machine, with several specialty stitches on it. That Kenmore got me through high school, college, and well into my married years. I even sewed my own wedding gown on it. However, it had the most cumbersome, impossible buttonhole attachment in the world so I would have to either use snaps or zippers or borrow someones else’s machine to do buttonholes. When my third child was born, I had had it with the Kenmore and my husband bought me a Singer Futura machine, the top of the line. I sewed on it for years, making clothes and home dec items for my whole family. But finally something broke on it and when I took it in for repair, they told me not only that Singer no longer made the Futura, but they no longer manufactured the parts! It seems that the Futura was the Edsel of the Singer line. So I junked it and moved into the computer age with the purchase of a Janome 9000 machine. Since then I have sold the Janome and purchased a Babylock computer machine and a serger. Now the sky’s the limit. When the oldest of our 5 children went to college, I decided to sew for money to help out with tuition. 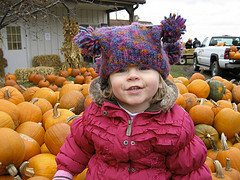 I began a children’s hat and dress business, which I called Fairy Stitches. I had no trouble with designing and sewing my wares, but I discovered that I HATE marketing! Then, all of a sudden, my father got me an order from Nordstrom’s department store and they wanted 100 hats yesterday! Suddenly, I was buried in work. I had to enlist the help of all my sewing friends. Even my husband and 5 kids were put on the assembly line. When that first order was safely in the mail, they all turned to me and said, “Either you hire an assistant or two, or you quit this, because none of us can go on like this.” I agreed. Besides, it hadn’t yielded the needed college tuition help I was aiming for and I hated the sales part, which was rather essential to the income part. So with a lot of life lessons under my belt, I sold the business. 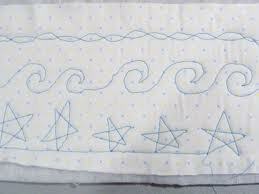 Shortly after that, I was introduced to quilting! I was already doing a lot of cross stitching, embroidering, and a little knitting and figured that I didn’t need to get into another hobby. 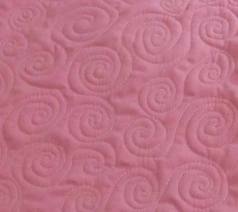 However, what nobody told me was that quilting is addicting! Which brings me to the subject of my STASH. From all the years of garment sewing, I had accumulated a lot of fabric scraps and even bolts of fabric in my stash. Over the years I had sewed on the kitchen table and in the basement (YUK) and was then sharing a room with my husband and his brand new computer. My stash was threatening to bury us both. Soon, he decided to take over our glass solarium as his office and I got the whole den to myself! And still, the stash and tools expanded to the point of insanity. By that time, all the children had moved out and I had my eye on a nice big bedroom upstairs as my sewing room. We decided to swap the sewing room for the bedroom and made a nice downstairs bedroom. I cleaned, painted wall-papered and curtained my new sewing studio. I bought storage and sewing furniture. The great transfer of all the “STUFF” began. It was a perfect opportunity to glean out the best of the stuff and get rid of the rest and I did it! I was so proud. That was 10 years ago and do you know what has happened since then? My stash has undergone asexual reproduction! Oh yes! And once again I am buried in stash. Oh dear! So, this week I have begun Operation Clean Out. Everything except the furniture and shelving went into another bedroom, where I have spent hours and hours going through every bin, box, drawer, and plastic organizer, gleaning out what I can’t live without and putting the rest out in the hallway to give to some other deserving soul. Then, before placing things back in the sewing room, I have organized and labeled things to make it easier to see what I actually have - and, in the process, adding more things that I decided I could live without. Now the upstairs hallway is heaped, but my sewing room looks so good, it is actually inviting! A quilting friend of mine makes quilts to send to an orphanage in Brazil and said she was open to receiving any fabric I wanted to get rid of. Look out, Rhonda! Here it comes! 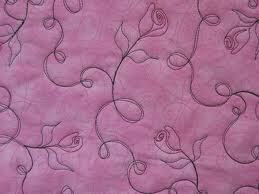 I am now ready and anxious to get going on sewing and quilting projects for Christmas. Now, if I could just figure out what to do with my knitting stash!!!!! I’ve returned home from an exciting weekend with thousands of fellow quilters! 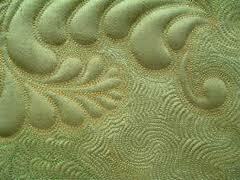 I attended the 2009 Quilt Expo in Madison, WI. My dear hubby graciously went along and even attended some workshops so that I could gather as much info as I could in the 2 days. I had no idea there were so many quilt shops in Wisconsin! I think nearly every county was represented plus some from Illinois. Over 300 amazing works of quilt art were on display for the competition (not any of mine!). I shopped till I dropped at the hundreds of vendor booths. I learned some terrific ideas on designs for purses, learned about the Cotton Theory of making quilts by quilting each block as you go, got excited about working with wool to make beautiful wall hangings and table toppers, and fell in love with quilted landscape art. I got to meet Nancy Zieman of Sewing With Nancy from Wisconsin Public Television. My husband took 5 pages of notes on the best types and brands of needles and threads for a plethora of projects as well as soaking up all the latest ideas on using photo cloth and the PC printer to produce quilt blocks from favorite photographs (and he is an excellent photographer). I photographed quite a few quilts, but we are not allowed to post those photos or I would show you! I am ready to organize my sewing room and get to rotary cutting and stictching. As soon as I complete something, I’ll post a photo!